Cartoon Saloon will go into production at the end of March with a new animated feature film version of ‘Moon Man’. 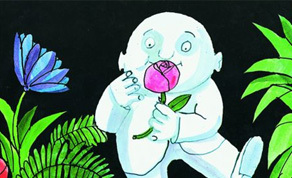 Based on the best selling book by Tomi Ungerer, the feature will be directed by Stephan Schesch. The group is also currently working on a pilot for Disney. Originally a children’s book, ‘Moon Man’ is a gentle satire that tells of the adventures of the Moon Man, who leaves his lunar home and, using a passing comet, travels to earth – a place he has observed for many years. The 2D feature film version of the book will be made by Cartoon Saloon, Schesch Films and Le Pacte Films– representatives from the three companies having met at Cannes last year. The film will be directed by Stephfan Schesch who has already produced a film version of Ungerer’s other novel, ‘The Three Robbers’. ‘Moon Man’ will be produced by Stefan, Le Pacte Film’s Jean Labadie (Himalaya) and Cartoon Saloon’s Ross Murray (Old Fangs) and Paul Young (The Secret of Kells). Irish animators who will work on the project are Cartoon Saloon’s Fabian Erlinghauser (The Secret of Kells), Sean McCarron (Song of the Sea) and Marie Thorhauge (Old Fangs). Irish funding for the project comes from the Irish Film Board (€300,000) and Section 481. The film’s overall budget is TBC. Le Pacte films will act as co-producers for the film and the sales agents. Writer Tomi Ungerer, who is now based in Cork, acted as consultant to the filmmakers in the feature’s development stages. Cartoon Saloon’s Paul Young tells IFTN he is a big fan of the author: ”He’s an extremely interesting man with a very varied career,” he tells IFTN. ”He designed loads of New Yorker covers over the year and he did the poster for ‘Dr Strangelove’. We’ll be staying very true to his artwork in the book.” (pictured above) Cartoon Saloon are also currently working on a Disney pilot.